We get it. You’re busy. By the time you get one shipping pallet unloaded, the next one has arrived. Before you know it, there’s a stock pile of pesky pallets out in the back alley! We can help. 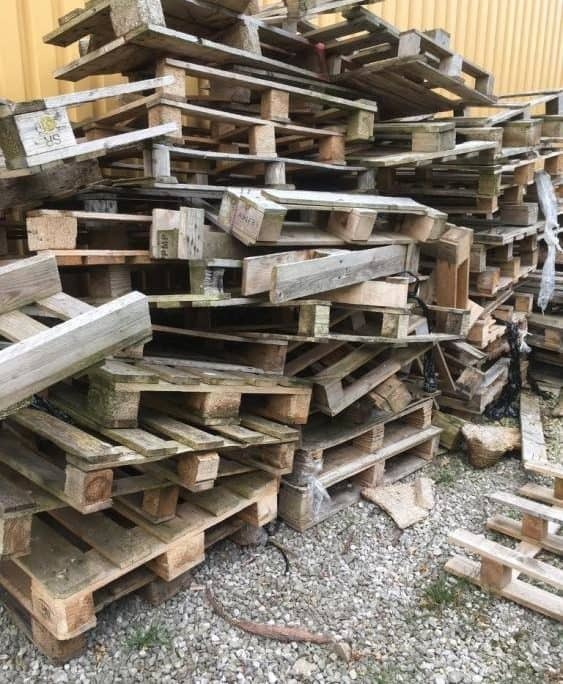 We pick up and recycle your pallets for you to ensure your business operations stay safe; and prevent code infractions caused by congestion on the premises. Commercial clients who receive regular pallet deliveries benefit from our ongoing, scheduled pick up services tailored to suit your needs. For greater ease and efficiency, we also offer discounted rates for regular pallet pick up services. What do we do with Pallets? Wood pallets are popular for DIY projects, too, and people sometimes contact us to see what we have on hand. With a little creative ingenuity, wood pallets can be fashioned into things like coffee tables, garden trellises, swing seats, shoe racks, and headboards. Painted or chemically treated pallets require special handling and may not be safe for DIY use, at Island Junk Removal Solutions we’ll make sure these pallets are disposed of properly.